Get This Guy Off the Beach! Mike’s been spending way to much time at the beach lately: Running, swimming, surfing. Time for MORE CLIENTS! Mike is a specialist in writing, the Internet, social media strategy, and most importantly, Brand Journalism. If you need a freelance writer to work on some projects, contact Mike today! Then he proceeded to give me a “D” in a class I needed to graduate. I never received less than an A in a writing class. He was the only professor that taught the class. University policy: you can’t graduate with a D, so a D was essentially a failing grade. He had me in a vice-grip. I eventually forgave him because he was a fool. Don’t be mad at fools. Don’t give them that power or control over you. Of course it didn’t hurt that I went over his head to the Dean, a former Commander in the Navy and Viet Nam Vet, and the Dean allowed me to take the class again with a different professor grading my papers. I retyped the exact same papers from the “failing” semester. Got an A. Turns out that the professor that worked to stop me from graduating was an extreme liberal and didn’t like that I wore a badge and uniform to class. I was employed full-time as a lieutenant in the Marine Patrol. The Marine Patrol Chief gave me a break to go to class during a flex-lunchtime so I could complete my last class in college and graduate. There was no time to change before class. I had to go “off the grid” on my two-way radio in the rescue truck and get back on right away after class to make the flex-time work. This was in the 1970’s and most college professors hated the military or anyone in uniform. Sounds like this century too. He told me early in the semester that I shouldn’t be allowed to wear my uniform to class. So this academic elitist decided to try and do me in. That was in 1979. Flash forward 10 years later. I won a NY Film Festival Award in 1989 for producing a production that showed the world what the Web would be like when it went “live” in 1995. It received international press, made the NY Times, and the production was shown on NBC’s Today Show and ABC’s Good Morning America. I’ve been working as a professional writer, producer, and marketing/PR executive for over 30 years now with cover stories in PC Magazine, real estate magazines, dozens of newspapers, TV segments on Discovery Channel, and on and on. Employers and clients include: IBM, Motorola, Pulte Homes, World Wildlife Fund, Icom, and hundreds of others. The professor of nothing did exactly that. He retired without ever creating a thing worth talking about and I’m positive his students didn’t learn anything from him. Remember, I know, I had to take his class twice. So many people have so many hidden agendas. You may never know the real reason for criticism and rejection. Sometimes it’s honest. Many times it’s caught up in something that has nothing to do with you. Move on. 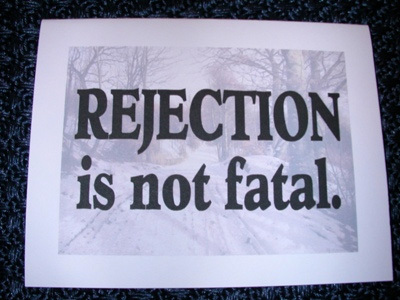 Like every writer, I’ve been turned down on projects, received rejection letters, and suffered some disappointments. Everyone does, not just writers. But the positives of having productions win a $50 million account from the Vatican, a $1.2 billion order from the Premier of China, an International President Award from the World Wildlife Fund, plus many other successes, far outweigh the negatives. Work hard at your craft. Learn it. Let your work speak for itself. Wrestle it into submission to make it great and publish. Don’t take no for an answer! Be productive! If you love your profession, you’ll be successful.